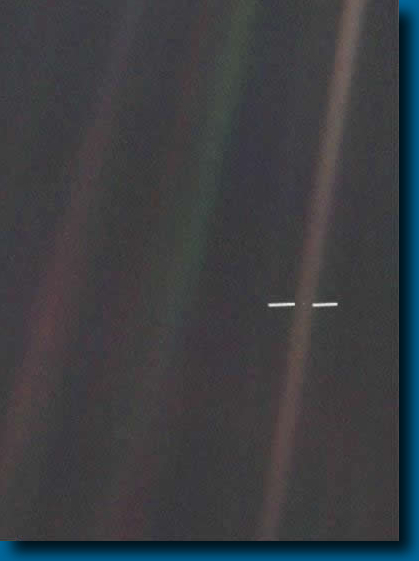 The photo above was taken by Voyager 1 in 1990 as it sailed away from Earth, more than 4 billion miles in the distance. I felt that this explained things so well, there is really no need for additional words. I can say that picturing our whole planet Earth as a ‘mote of dust, suspended in a sunbeam’ caused me to look at the world we are in differently. The comparison of the size of a mote of dust to our own planet, and then to what we know of space makes relative size not only unfathomable by the human mind, but irrelevant. This entry was posted in Spirituality and tagged astronomy, blue dot, books, carl sagan, philosophy, relative existence, space by AmyRxBaker. Bookmark the permalink.